I love salads, but I like variety in my salads. As a result, I’m always looking for delicious new salad recipes. This one definitely fits the bill. Roasted beets, carrots, alfalfa sprouts and tuna fish – it’s a great combination, packed with nutrients and beautiful to eat as well. The dressing is simple and easy to make up. It’s one of the dressings that you can stick in a half pint jar to mix it (just screw on the lid and shake) and any leftover dressing, leave in the fridge for the next round. You’re welcome to use canned beets instead of roasting your own, just make sure you drain them well and pat them dry before slicing them. You can typically find alfalfa sprouts in the produce section of your grocery store, or you can get a kit to make your own sprouts. Sprouts are great in salads and sandwiches as well, so it’s not a bad thing to have on hand. Try this beautiful salad with roasted beets and julienned carrots, mixed with alfalfa sprouts and tuna. It’s topped with a savory dressing that is rich and creamy. 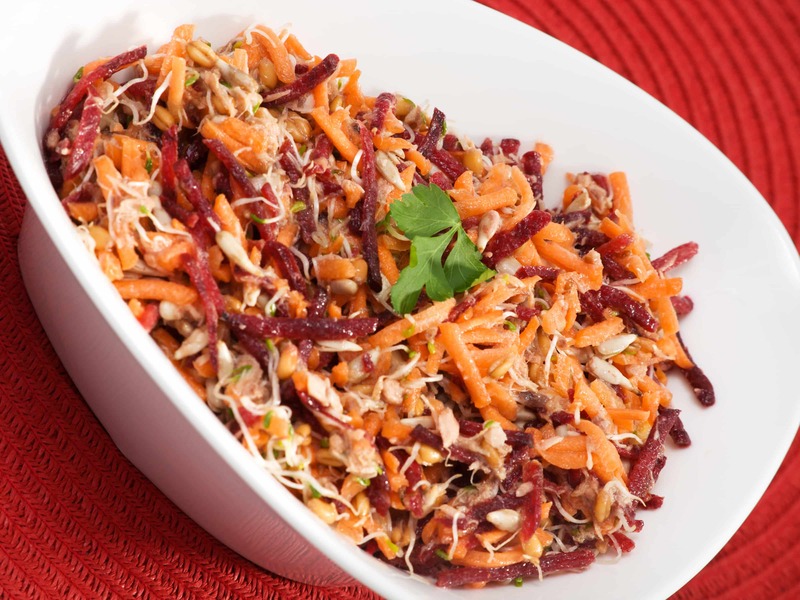 In a bowl, combine the beets, carrots, bean sprouts and tuna. Toss to mix. In a small bowl, combine the dressing ingredients (parsley, sunflower seeds, mayonnaise, yogurt, garlic, lemon juice, cayenne and sea salt). Whisk to combine. Pour the dressing over the beet and carrot mixture, toss gently to mix well.